Although preservice teachers are often “digital natives,” meaning they grew up with and are familiar with common computing devices, they often are not actually proficient in using them for advanced purposes. In fact, there is a lot more to technology than mere social networking websites and apps. Educators often have many types of files and data to manage and share with their students and colleagues. It is important to establish productive practices that minimize wasting time and loss of data. The typical teacher or professor is working many hours per week, frequently in an office setting with Windows PCs provided by their institution. In fact, they often are not even able to install software or fully configure the software available to them. For this reason and others, for practicality it is necessary to manage digital data using commonly available practices and tools. Therefore, we are often restricted to file-level management and web tools. Organization and naming of one’s files and folders is still important to finding and maintaining data, in part because of Windows’ abysmal search functionality. Depicted right is a selection of folders for classes I have taken or been a teaching assistant for at University of Central Florida. Here, we see I have made many choices, with various pros and cons. I have chosen to organize my folders by course code, in a flat structure that includes many different semesters, thus avoiding navigating through many levels of subfolders. I have included other folders not directly related to classes, and have forced them to be displayed at the top of the list in Windows Explorer by prepending the folder names with symbols (here, “%”). For readability, I have used both capital and lowercase letters, and have included the year and semester subsequent to the course codes. I use hyphens instead of spaces because spaces in folder and file names can be problematic when data is directly uploaded to a web server. For classes I am currently enrolled in (not shown here), I prepend the folder names with “!” so they appear at the top of the list, and then remove the “!” at the end of the semester. Note that there is a tradeoff here—renaming a folder breaks shortcuts or links and forces many “dumb” applications (e.g., Google Drive, SyncBack) to delete and re-copy the entire folder. 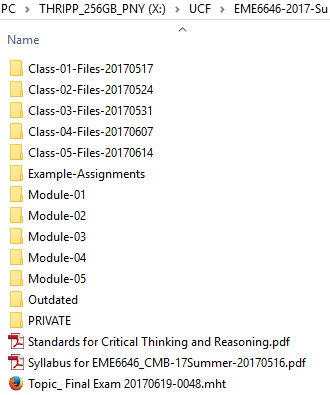 Here, we have one of my course subfolders (EME 6646, pictured right), which contains additional subfolders to organize files related to this class. The upper six folders consist of files provided by the professor, while the module folders contain more folders and files relating to each module’s materials and assignments. 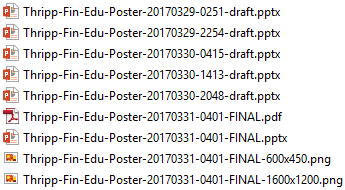 The “Outdated” folder contains an older version of the syllabus subsequently replaced by the professor, and the “PRIVATE” folder contains peer evaluation assignments I did not want to share with teammates. This course had a lot of group work, so I actually shared my files for this course (minus the private folder) with teammates via Google Drive. In the EME 6646 course, moreover, we used Google Docs to collaboratively edit our group assignments, and then at the end, I would manually copy-and-paste into a Microsoft Word file and correct formatting prior to submitting the group assignment. Of course this is inefficient, but the professor would not accept Google Docs submissions, so it was more efficient than sending many different Word files back and forth. One might ask why I did not just edit files directly in my PC’s Google Drive folder? Well, what if Google Drive does something weird, or my colleagues accidentally delete or damage a key file? Then, my Google Drive would automatically synchronize the undesirable changes, resulting in data loss. Backing up your data regularly is important to avoid data loss. However, when synchronization occurs in the background, without user input or reversibility, your data can easily be wiped out by an undesirable change in one place being automatically propagated to another place. This is why RAID-1 disk mirroring is not backup, although it protects against failure of a hard disk drive. Going back to educators having office PCs at work that don’t allow them to install software, this is a reason I like working from home. I work on my class files, even when at home, directly from a flash drive, while running a SyncBackFree profile frequently to backup the flash drive to one of my PC’s hard disk drives. Then, I can work directly from the flash drive in the field while assuredly having the latest copy of my files. You could also use Google Drive via the web interface, but this has disadvantages too (e.g., must log-in to Google first, cannot save files directly to Google Drive, Internet problems, limited to 15 GB for free, latency). Another piece of the puzzle that I added a year ago is BackBlaze, which securely backs up all files on my home PC (except it will not backup flash drives) for $95 per two years (or, you can pay $5 per month). Although BackBlaze will not backup my flash drive directly, because I am using SyncBackFree to backup the flash drive to a hard disk drive, all my data still gets backed up to the cloud, which is literally multiple terabytes because I am also a photographer who shoots in RAW mode, even on my Samsung Galaxy S7 smartphone (BackBlaze offers unlimited backup, even though they lose money on customers like me). Digital asset management is the buzzword particularly for managing many thousands of photos or other non-text data, but such software is too complex and unwieldy for educators’ purposes. Basically, working directly with files and folders is your main option for types of data such as PDFs, Word, Excel, et cetera. For note-taking, I use EverNote (with reservations), which is great for writing, searching, and sorting through text or even PDFs, images, and receipts if you pay for the premium version. I would not recommend taking notes in text, Microsoft Word files, or Gmail drafts because they are harder to search, manage, and/or synchronize. I have come very much to like taking notes in EverNote on my phone with a Bluetooth keyboard to type on. One of my big shortcomings is my complete lack of familiarity with Apple products. Some of the issues I talk about here may be Windows-specific and the situation may be much better on Mac… but nevertheless, you are much more likely to be compelled to work on a PC than a Mac. Although it is dated and no longer updated, I use Locate32 to search through files on my PC, which is much faster and better than Windows or Cortana search. It is especially useful if you give descriptive filenames, which I recommend, although it takes practice to make filenames short, consistent, useful, and quick to devise. When naming files and dealing with different versions, a simple and effective approach is to make a copy for each editing session and then save it with the date and time (“timestamp”) in the filename, as pictured left. 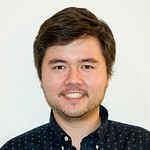 If you are working in Adobe Photoshop, you might use non-destructive editing techniques such as layers or parametric editing instead. However, Microsoft PowerPoint and many other applications cater toward destructive editing (where data is deleted or overwritten during the editing process), so multiple files with timestamps is the simplest compromise. Then, you can revert or borrow elements from a prior version if needed. Although this takes up additional storage space and duplicates material, you could always archive the files in a 7-zip archive afterward. For example, the pictured files are 3.5 MB but only 1.5 MB in a .7z archive. Note in this example that I have used YYYYMMDD-HHMM format for the timestamps. If you use MM-DD-YY format, all the files from the same month are clustered together, even if they are from different years! This is why formatting the timestamp in order of declining significance (i.e., year, month, day, hour, minute) is preferable. Then, files will be sorted chronologically. Further, I recommend using and becoming familiar with the 24-hour clock, because using a 12-hour clock would end up grouping files from 5 AM with files from 5 PM. You could use YYYY-MM-DD-HH-MM format for easier readability while maintaining chronological sort, albeit with slightly longer filenames. You could also use two-digit years, but I prefer all four digits because it makes it clearer that you are looking at a year, and will not be confusing in future centuries. Here, I have put the timestamps toward the end of the filename. An alternate approach, more useful in some situations, is to put the timestamp right at the beginning. Then, all files in a folder will be sorted by timestamp. In other situations, you may want files to first be grouped by some other keyword(s), so the timestamp should be placed later in the filenames. Note that you can also use the “Date Modified” column in Windows to sort the files by when they were last edited. However, this option is not available in many settings (e.g., the Google Drive web interface). While there are many other pieces to effectively managing your digital data (e.g., a ScanSnap ix500 scanner, LastPass or Dashlane, VeraCrypt or BitLocker, etc. ), organizing and backing up individual files is a principal component and important starting point. Putting the time in to learn about this and establish good methods now will pay great dividends in the long run.